Don’t we all want to be in the ‘Tropical State of Mind’? 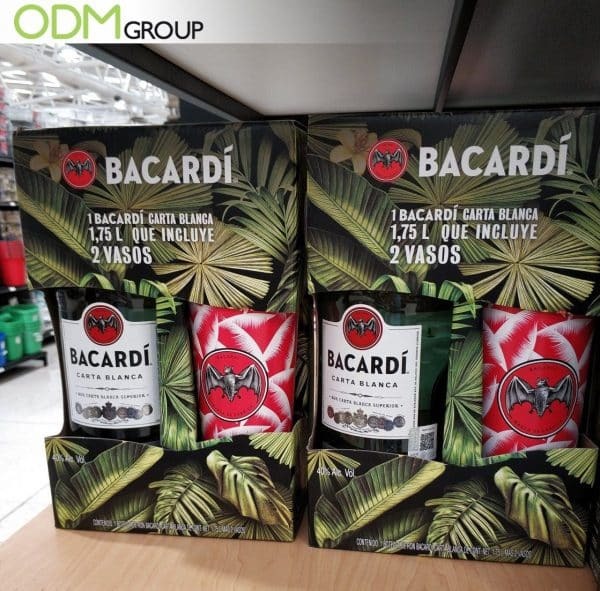 Bacardi has captured the essence of being in the “Tropical State of Mind”, through the use of exceptional liquor packaging design and custom gift with purchase. In this Case Study, we will be focusing on Bacardi Carta Blanca’s Promotion. The University of Portsmouth has held research on the relationship between music volume and alcohol consumption. It was concluded that people tend to drink larger quantities of alcohol at faster rates when there is loud music. The researched also claimed that these beverages taste sweeter when listening to loud music. With a natural desire for sweetness, customers will have a tendency to drink more alcohol when in a boisterous environment. With customers consuming larger quantities of alcohol, they will be more inclined to purchase more on their next visit. 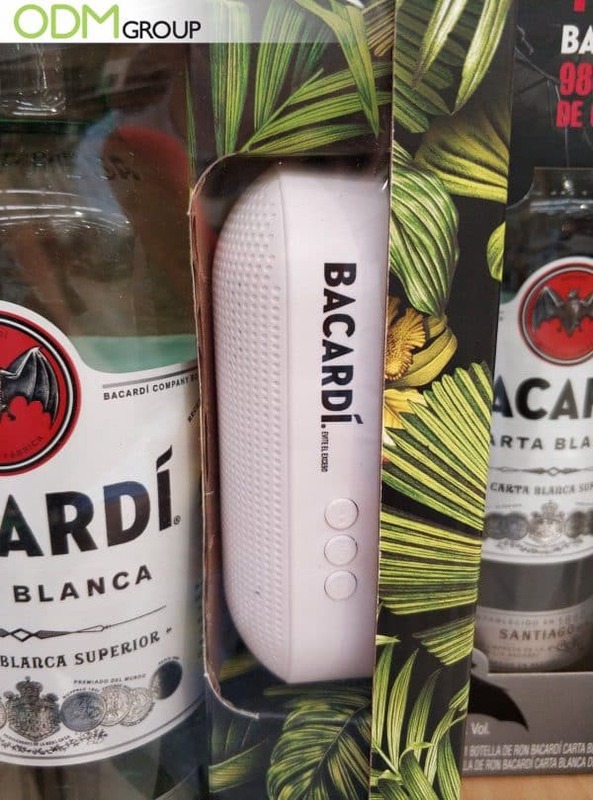 Bacardi opted for a small-sized white speaker. We are unable to tell firsthand if the speaker has Bluetooth capabilities, but considering the widespread use of Bluetooth, we assume it has. Having a compact Bluetooth speaker is not only useful when drinking but also for other events such as social gatherings, and picnics. Its multiple uses allow for extensive brand exposure. The brand name is also printed clearly in black, alongside the words ‘evite el exceso’. Translated to English as ‘Avoid Excess’, we absolutely love the fact that Bacardi is adding subtle details to remind customers not to drink too much as part of their Corporate social responsibility. Need Promotional Ideas? Why not consider a Multifunctional Bluetooth Speaker? There are some who drink directly from the bottle, but for the rest of us, glasses are essential when drinking. 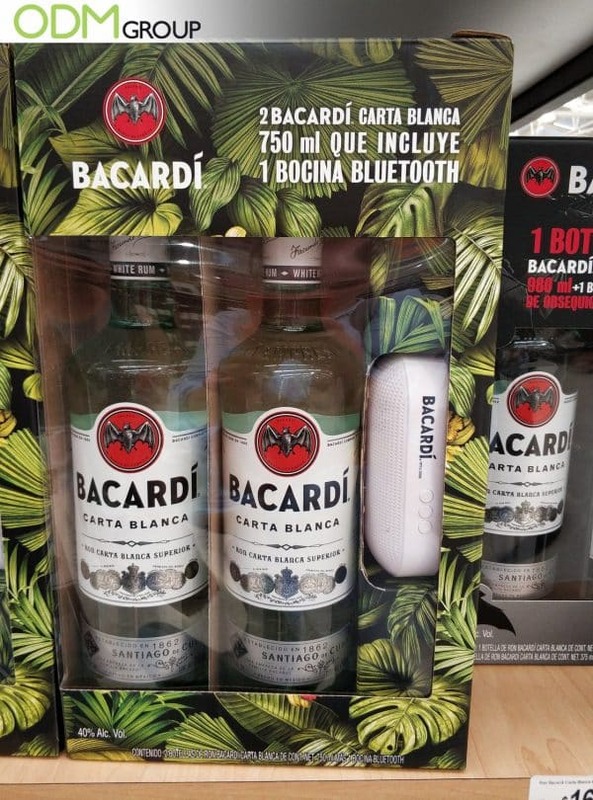 Bacardi has definitely taken this into consideration by including 2 free promotional branded glasses when purchasing a 1.75l bottle of Carta Blanca. Bacardi’s bat logo is printed on the glasses in white. There are also many white palm leaves to fill in the empty space and further add to the tropical vibe. We are unsure if the glasses are made of glass or plastic, but would prefer if it were glass. Why? Because it is possible for plastic to contain unhealthy chemicals such as BPA or PVC, and we definitely do not want that in our drinks! With glass, we can safely reuse it infinitely. Bacardi could have expanded on the ideas of ‘essentials’ and add other promotional drink products like stirrers and custom jiggers to form a custom gift set. Need tips on how to implement a successful custom gift with purchase? We’ve got you covered! 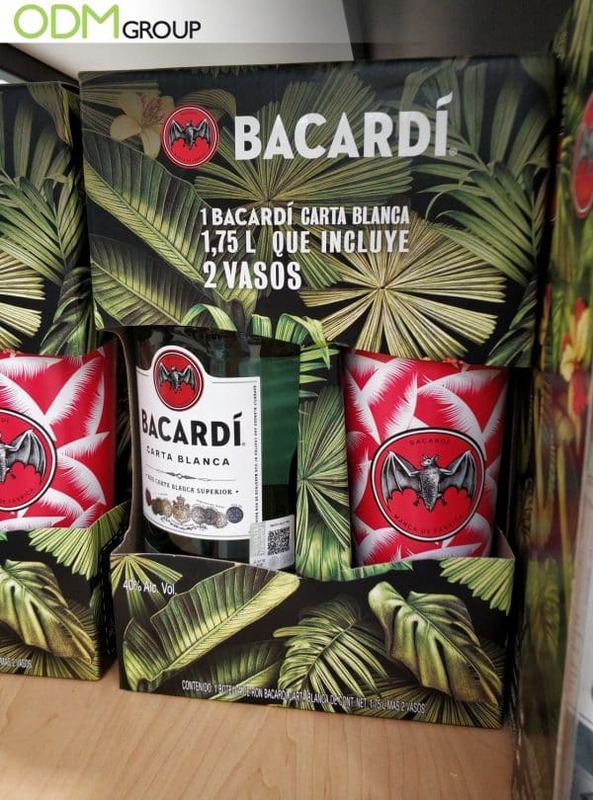 To match Carta Blanca’s fruity and nutty taste, Bacardi has opted for a tropical design for their packaging. The packaging is mainly green in colour, thus the white label and white fonts contrast the packaging well. Not only does white give the impression of being complete and pure, but also coincides with Carta Blanca being a white rum. Alcohol is commonly used as a mean to ‘escape reality’, this also jibes with ‘tropical vibes’. Thus, Bacardi could have opted for a tropical design to further push Carta Blanca as being the go-to alcohol to get away from reality. The choice of material used is cardboard. Cardboard is not only cost-efficient but also eco-friendly. Here is a case study on the benefits of using cardboard packaging. Custom gift with purchase is a good way to boost sales as it gives customers more reasons to buy your product. By providing a gift with purchase, customers will feel that they are paying less for the product/service bought as they are getting something in return. With people more willing to spend on product branding, brands should leverage by making custom branded merchandise. When executed correctly not only does a gift with purchase boost sales but also improves the relationship between brands and customers. Looking for On-Pack Marketing Ideas or Custom Retail Packaging for your products to boost sales? Fortunately, the ODM team can help you come up with inventive and unique product design and packaging. We have product designers who have vast experience in designing brand packaging designs for your business. Contact our team today to learn more about how we can help you grow your business through the use of effective promotional products! Need Ideas for Your Next Gift with Purchase? So we’ve covered what Bacardi did, but why not check out what Strongbow is doing for their GWP! So often when consuming alcohol, we like to add the subtle things that make our beverage tastier. Maybe a wedge of lime, or a cube of pineapple. So why not consider stirrers as your next GWP! GWPs are not necessarily present in packs, what about bottle neckers? Here’s an idea of what we’re referring to. Interested in promoting liquor in Duty-Free? Here are 8 tips on Promoting a GWP in Duty-Free! Planning your next GWP but need some tips? Here’s what makes an effective GWP. Still not Inspired? Click HERE for more Case Studies on Gift with Purchases!